AO-FVCOM is a regional model nested with Global-FVCOM (Figure 1). Global-FVCOM covers the entire global ocean with inclusion of all major rivers and a horizontal resolution of 2 km (in the coastal regions) to 50 km (in the interior). Global-FVCOM uses the same hybrid coordinate as AO-FVCOM and shares the same common grids over a transition zone connected to the nesting boundary. Both AO-FVCOM and Global-FVCOM are fully coupled with UG-CICE (Gao et al., 2011). Global-FVCOM is driven by a) astronomical tidal forcing with eight constituents (M2, S2, N2, K2, K1, P1, O1 and Q1), b) surface wind stress, c) net heat flux at the surface plus shortwave irradiance in the water column, d) surface air pressure gradients, e) precipitation (P) minus evaporation (E), and f) river discharges. The model includes 406 river inputs around the coast. AO-FVCOM is driven by the same forcing used for Global-FVCOM with the boundary conditions specified by Global-FVCOM results. Figure 1: Illustration of the grid of the Global-FVCOM and AO-FVCOM nested system. Click the image to view a full size image. 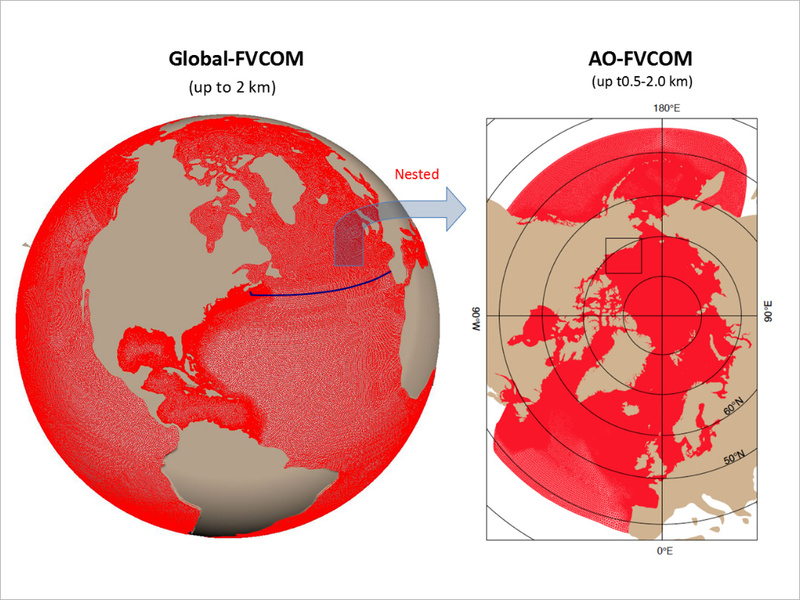 Three versions of AO-FVCOM were configured with a finest horizontal resolution of 8 km, 2 km and 300 m for the Arctic Ocean, respectively (Figure 2). 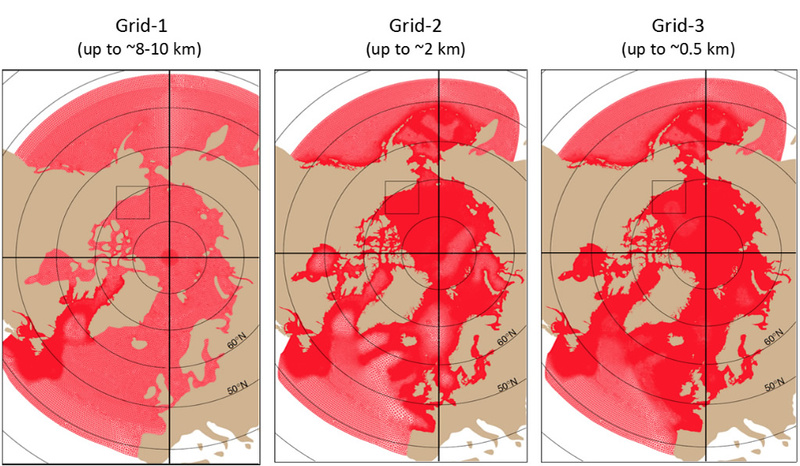 Both 8-km and 2-km versions of AO-FVCOM have been used to hindcast the sea ice and circulation for the period of 1978-2013. 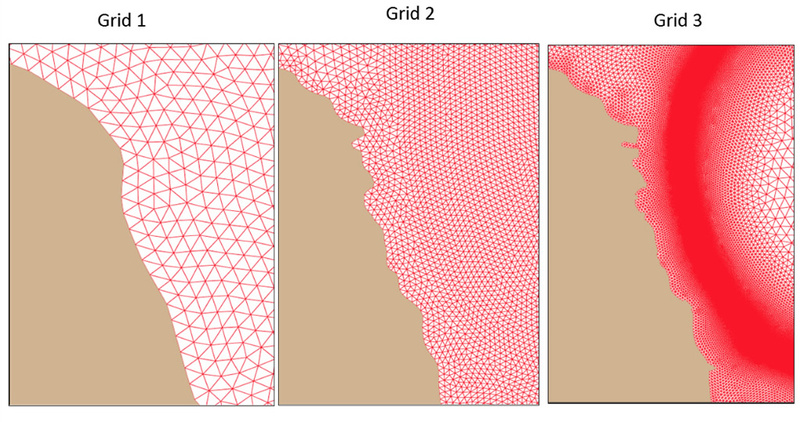 Figure 2: Grids and coverage areas of three versions of AO-FVCOM. Click the image to view a full size image. Figure 3: Enlarged views of the AO-FVCOM grids in the Alaska coastal area connected to the Beaufort Sea. Click the image to view a full size image.